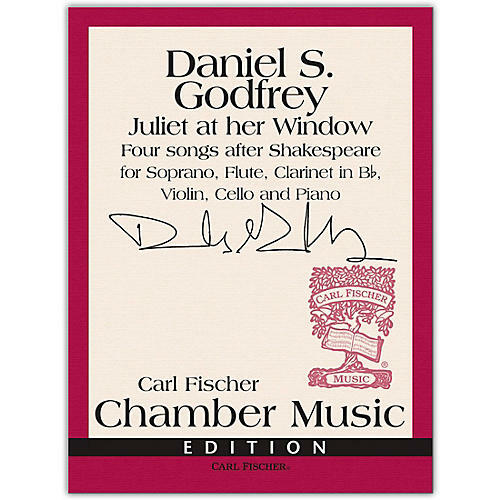 Composed for Soprano, Flute, Clarinet in Bb, Violin, Cello, and Piano, Daniel S. Godfrey's Juliet at her Window includes four texts taken primarily from Act II, Scene II of Shakespeare's Romeo and Juliet, with supplemental passages from elsewhere in the play. Lines are combined and rearranged to form brief, thematically related stanzas in each song. Godfrey's intention was to focus on Juliet's breathless optimism and extroverted declarations of love while hinting at the pathos, denial and isolation from reality that he believes underly them.